The folks at San Francisco International Airport have announced a special event to add a little fun to our When Art Rocked installation of vintage San Francisco rock posters. 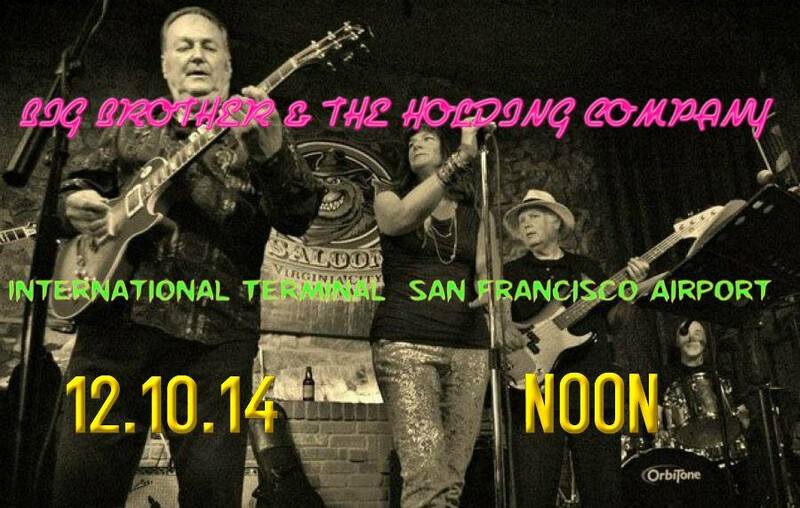 None other than Big Brother and the Holding Company will perform on Wednesday December 10th, 2014 at the International Terminal near the installation. Festivities start at 12:00 noon, and it’s FREE to the public. The SFO Museum staff did a splendid job on the When Art Rocked display, curated by our own Ben Marks. If you haven’t had a chance to see it, here’s a great incentive to come and check it out, and enjoy a batch of great classic tunes from Big Brother and the Holding Company. You can take BART and make it easy! Mark Holmstrand liked this on Facebook. Rich Siebe liked this on Facebook. Art Baumgarten liked this on Facebook. Ken Clarke liked this on Facebook. Ben Marks liked this on Facebook. Baron Urias liked this on Facebook. Engrid Barnett liked this on Facebook. Deborah Boernsen liked this on Facebook. Rocco Muscia Jr liked this on Facebook. Ron Klatt liked this on Facebook. Ron Fost liked this on Facebook. Singer Designs liked this on Facebook. Joao Henrique Carneiro liked this on Facebook. João Henrique Carneiro liked this on Facebook.